The approaches for intervention are many in helping military veterans recover from service-related medical and psychological conditions that threaten their well-being and lessen their coping skills. The Volunteers of America Southwest’s Hawley Veterans Services Center in El Cajon has adopted a unique live-in program for 20 veterans at a time, each of whom can stay for up to 18 months for treatment in individually tailored therapy sessions. A recently released study gauges the stakes. More than 40 years after the Vietnam War ended, about 11 percent of combat veterans are still suffering from post-traumatic stress disorder, with many getting worse rather than getting better. Roughly 271,000 Vietnam veterans reportedly suffer from PTSD, experiencing symptoms like flashbacks, nightmares and startle reactions. Around a third of them have been diagnosed with depression or anxiety. Veterans of the Iraq and Afghanistan conflicts have been diagnosed with PTSD at similar rates. According to Lizbeth Quiroz, program director at the center, the objective is “self-sufficiency,” so that program graduates can live successfully and thrive on their own. Hawley Center set up operations not long ago, opening in March 2013. The model was different from the outset, according to Quiroz. “This is not a standard program, not structured like others. The focus has been on the individual veteran in residence, on a weekly basis at least, daily if need be,” she said. Veterans can get into the center by referral from the Veterans Administration. About 75 to 80 percent of the residents have a dual diagnosis, mostly a mental illness—commonly, depression, anxiety, PTSD, schizophrenia or bipolar disorder—paired with substance abuse or alcohol dependency. About half the center’s veterans are overweight, with common associated problems of heart and breathing trouble. Some arrive from recuperative care, recovering from surgery at the VA Medical Center in La Jolla. “Stand Down is a big one,” Quiroz said, for linking homeless veterans in need with the Hawley Center. Most, around 90 percent, are homeless when they enter the program. The center provides shelter and food, three meals and a snack each day. Each resident receives hygiene and cleaning supplies free of charge. Monthly bus passes are given to those without cars. The existing two residence buildings on the 1.2 acre site feature gym equipment, a computer resource room, two refrigerators for other personal grocery items, two outdoor smoking areas, two patio barbecue grills, and two exterior storage containers to hold veterans’ belongings while they are living there. Quiroz has on staff one case manager, another supervising case manager, five case aides and one cook. Hourly rounds and daily chores bring needed oversight and personal self-discipline into the resident veterans’ restructured habits of life. Art therapy is available for those interested. The on-premises Victory Garden offer another form of therapy in tending the vegetables and plants gracing the front area of the property. A series of ongoing workshops focus, in turn, on improving relationships, stress management, nutrition, housing, mental health awareness, and relapse prevention. Each client veteran has a one-on-one weekly session with a case manager. The center’s employees are on watch for defusing situations before those escalate into problems for or between individuals. During the center’s first year in operation, the workers knew the program was good and was helping veterans make headway in regaining control of their lives. But they also knew that they were losing too many of their residents to relapse into drug and alcohol dependency. 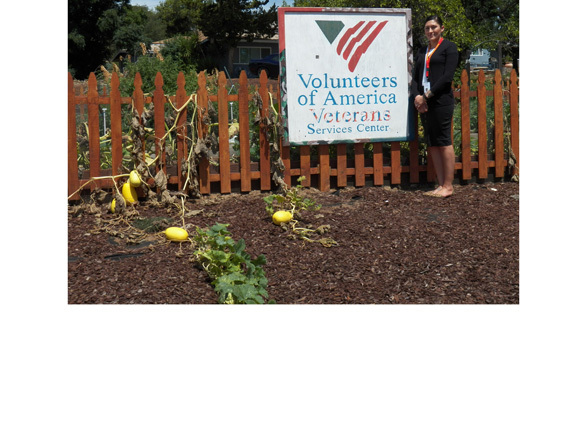 They began an assessment of how to retool and improve the program for a higher success rate in graduating veterans rather than seeing them leave for the Volunteers of America detox facilities and not return. And the program has become even more effective. There is a waiting list. Each veteran considered for enrollment receives an intake review. A face-to-face interview and site visit are scheduled. The quiet, rural setting in El Cajon’s Flinn Springs area is not for everyone. Available activities include horseshoe competitions, board games and card games. Quiroz indicated that older veterans are more attracted to the peacefulness. Transitioning veterans in the center receive counseling that guides them toward greater self-reliance. A related emphasis is placed on task and time management, so that the graduating veterans are in control of performing necessary household chores and living area maintenance. Personal responsibility for medication compliance is another large concern. Nutrition and exercise for healthy living are other important factors as veterans are learning to care for themselves on their own. Quiroz described two touching success stories for veterans treated at the center. One man, about 35, needed only to be brought into compliance with his schedule of medications for a psychological condition, and after three months at the center he had landed one full-time job and one part-time job. After six months, with training in savings and budgeting, he was able to buy a used Mazda, “in great condition,” according to Quiroz. She believes that small, individualized programs like the centers are more effective than large, group approaches in assisting military veterans toward recovery. The Hawley Center runs on funding provided by the VA and by the Department of Housing and Urban Development. The center can accept donations. Hawley Center residents always need hygiene supplies, cleaning supplies, clothing, bedding and pillows. The computer room needs a good new printer, for job seekers to work on resumes. The center requests volunteers to spend time there on weekends to help the residents on community building and forming relationships. Quiroz said that she and her staff members would continue making programmatic changes to continue improving the center’s effectiveness in serving those who have defended our liberty. More education and information will deal with the importance of nutrition and physical activity in restoring and maintaining health. She further envisions expanding the facility to a third building on the site. The Hawley Veterans Services Center is located at 9980 Hawley Road. Offers of help or requests for more information should be directed by phone to (619) 561-9808.